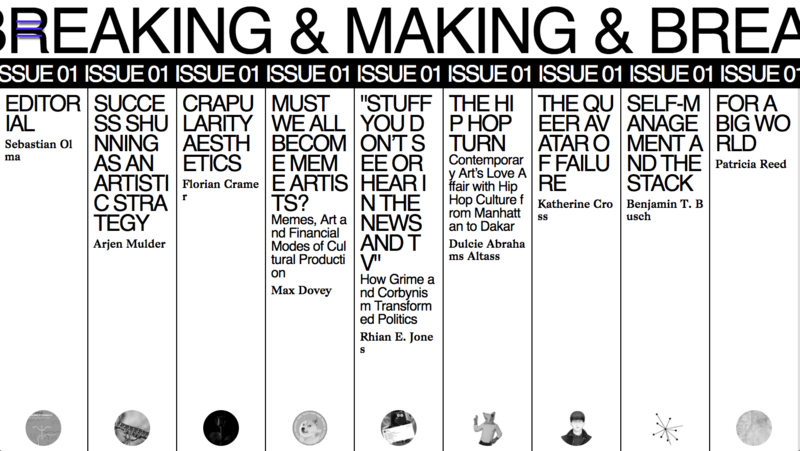 Making & Breaking is an online journal published by the Autonomy research chair of Avans University’s Centre of Applied Research for Art, Design and Technology (Caradt). Its aim is to provide a platform for critical discussion on issues concerning the relationship between cultural production and social change. This is to say that Making & Breaking rejects the naïve celebration of social “impact” that has become a staple of the creative industries discourse, while simultaneously resisting pessimism that frames cultural production reductively as merely an epiphenomenon of neoliberal capitalism. Instead of simply assuming the existence of a critical distance (to society at large) within the field of culture and the arts, what is at stake for Making & Breaking is the theoretical and practical search for forms of cultural production that contribute to the creation of social betterment: an emancipatory vision of planetary futures that dissolve the debilitating wealth, power and representational inequities of our present. To put it in the words of Mark Fisher, whose work served as an impetus for this publication in many ways, what we are reaching for is “a new humanity, a new seeing, a new thinking, a new loving”. As Making & Breaking addresses cultural producers as well as students and academics across a variety of related fields, it aims at being accessible in its language while intellectually rigorous in its arguments. The first issue was edited by Seb Olma and Patricia Reed, Web Design + Build by Patricia Reed.